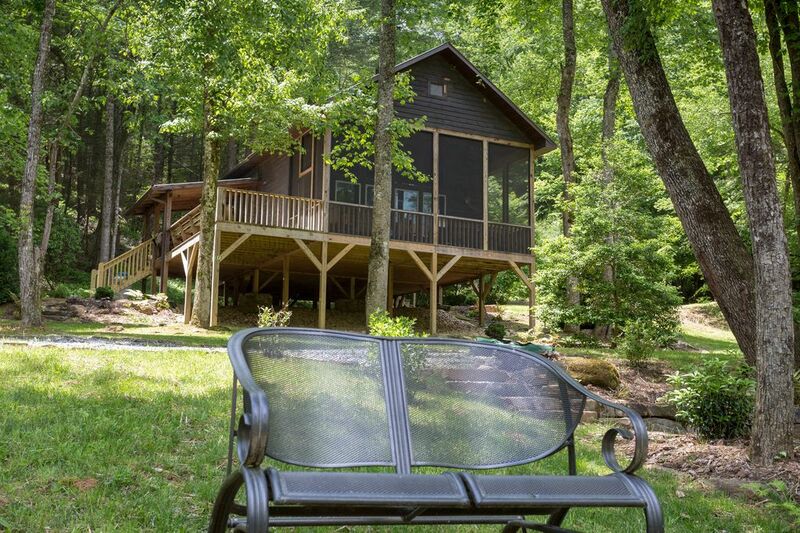 Make your upcoming Blue Ridge vacation a memorable one when you stay in this lovely riverfront cabin with a private hot tub, deck, outdoor firepit, and much more. Featuring a secluded setting and close proximity to town, you'll enjoy the perfect blend of privacy and convenience. This little gem is nestled in the Aska Adventure Area, on the Toccoa River so that you can fish for trout right in your backyard. You'll also find the Toccoa Riverside Restaurant and the Shallowford Bridge nearby, and both Blue Ridge Lake and downtown are only eight miles away. Get cozy in the inviting living area and enjoy a cup of tea by the gas fireplace while you watch the cable TV or use the free WiFi to stay in touch with friends at home. In the summer, enjoy the partial AC or lounge on the deck and revel in the peaceful sounds of the forest and river. The fully equipped kitchenette will allow you to stay homebound and fed if you like, and a gas grill and dining table on the screened porch are available for tasty barbecue dinners and al fresco dining. Toss the laundry in the private washer/dryer at the end of the day and take a nice, luxurious soak in the hot tub. Come to Blue Ridge to slow down and take a break from your busy life. Book this cabin today! Beautiful cabin and very relaxing! Will definitely be back! The location is beautiful near the river and in the woods. Good places to eat just around the corner with friendly people. Loved this cabin so much! Not to far from downtown blue ridge either! We had a rocky check in, the code we were given was wrong but after calling the help number they got us in quickly. Once entering it was beautiful and just like the pictures but no heat was left on and it was 40 degrees inside with only a small plug in heater to heat the entire place. Took about 3 hours to get it a comfortable temperature and not see ourselves breathing. Other than those two things, after driving in the dark and rain to get there, everything was great and smooth. You can't beat the location and the hot tub was great too! My boyfriend and I really enjoyed this beautiful paradise deep in the woods of blue ridge. We were able to relax with an amazing view. The owners were very friendly and great host. We chose the late check out and it was worth it because you don't want to leave as soon as you wake up, you want to enjoy the scenery before you leave and take it all in !! We truly enjoyed our alone time together. I took my wife for her birthday and we had a great time. The only negative comment would be about the fireplace. It is a stand alone gas fireplace and it faces the end of the couch. It serves it purpose to heat the cabin but can't really sit in front of it. The location by the river makes up for it and we had a great time in downtown Blue Ridge. The cabin is nicely stocked with all the basic needs. We would definitely book again. Thank you for your suggestions concerning the arrangement of the furniture in regards to the fireplace. Thank you!